The UK is the sixth richest country in the world and yet more than one in four children is growing up in poverty today. Child poverty damages childhoods. Growing up in poverty means being cold, going hungry, not owning belongings that others consider essential and not being able to join in activities with friends. It also impacts on health, educational outcomes and the overall experience of childhood. Child poverty destroys life chances. Leaving school with few qualifications translates into lower earnings over the course of a working life. Poorer childhood health results in more complicated health histories over the course of a lifetime, again influencing earnings as well as overall life quality. Child poverty imposes costs on broader society. Governments forgo prospective revenues and commit themselves to providing services in the future if they fail to address child poverty now. Cross-national studies and evidence gathered over time show us that child poverty is not a natural phenomenon. Instead it is a political phenomenon – the product of choices and actions made by government and society. well over half of parents in poverty (61%) say they have cut back on food and over a quarter (26%) say they have skipped meals in the past year. around 1 in 5 parents in poverty (19%) say their children have to go without new shoes when they need them. a large number of children in poverty say they are missing out on things that many other children take for granted, such as going on school trips (19%) and having a warm coat in winter (14%). only 1 in 5 parents in poverty (20%) say they have not had to borrow money to pay for essentials, such as food and clothes, in the past year. A recent study by the Institute of Fiscal Studies (IFS) estimates that 800,000 more children will fall into poverty by 2020. That would be a rise in the child poverty rate from 19.9% to 24.4%. This will be the biggest increase in child poverty since the 1980’s, and would completely reverse the improvements made by during the last decade when 900,000 children were removed from poverty. 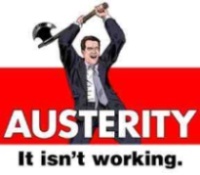 The IFS figures are for children living in absolute poverty. Millions more children live in relative poverty. As the govt’s spending cuts continue, so more and more families are at real risk of slipping into poverty, either from a reduction in tax credits, child benefit, the decision to uprate benefits in line with the consumer prices index rather than the retail prices index (which tends to show a higher annual inflation rate), the time limiting of employment and support allowance or from the loss of their jobs or stagnating wages. Poverty affects every aspect of a child’s life. 47% of children with asthma are from the poorest 10% of families, poor children are 5 times less likely to have access to a safe outdoor play area, 85% of children living in damp flats have breathing problems. Austerity measures may also affect children in more subtle ways. There is another type of poverty, one that is more difficult to define and quantify, that of emotional poverty. As the unemployment rate soars, many households are experiencing joblessness for the first time. Children are far from immune from the negative effects of austerity. The additional stress levels, lack of funds and general loss of confidence experienced by parents and family members must impact upon children also. It has been proven that unemployment can become cyclical for generations of families. These children are feeling both the direct and indirect outcomes of unemployment and austerity measures likely affecting their own participation in the workplace in future years. Children’s charity Unicef has published a report highlighting that child poverty rates within the UK are set to increase significantly, due to government spending cuts. There is recognition that child poverty is one of the most crucial indicators for measuring successful social cohesion, a marker of wellbeing and future prosperity of any given nation. Long-term effects of child poverty include: issues in education, employment, mental and physical health problems and difficulties with social interaction. The standard of living encountered during a person’s childhood is recognized as being instrumental in shaping their future. Unicef warns that during times of economic recession, children can “drop off the policy agenda” in the scramble to effect immediate change, all planning for future generations is perceived as of secondary importance. This is highly problematic, not only because future planning is negated in favour of a short term outlook, but because a child’s current living situation is under escalated risk during times of financial crisis. Children, as one of the most vulnerable groups of people, cannot be left out of the equation especially in times of financial recession. This government has proposed changes to child benefit; however, major inconsistencies regarding financial eligibility led to strong opposition and initial proposals were re-drafted highlighting the governments’ incompetence in making basic calculations. The Child Poverty Action Group has already warned that the proposed cuts to child benefit will have an adverse effect on children’s wellbeing. They questioned the moral issue of using children as a battlefield for austerity. End Child Poverty, a coalition of more than 150 charities, welfare organisations, social justice groups and unions has published a report and interactive map detailing the level of child poverty in each constituency, local authority and ward in the UK. The campaign predicts that, as benefits start to fall in real terms later this year, the proportion of children living in poverty will increase significantly. “The child poverty map reveals the depth and breadth of child poverty across the country showing the gross levels of inequality that children face in every region. Far too many children whose parents are struggling to make a living have to go hungry and miss out on the essentials of a decent childhood that all young people should be entitled to. The huge disparities that exist across the country have become more entrenched and are now an enduring reality as many more children are set to become trapped in long term poverty and disadvantage. Within the local Boroughs in our area, there is a very contrasting picture from ward to ward. 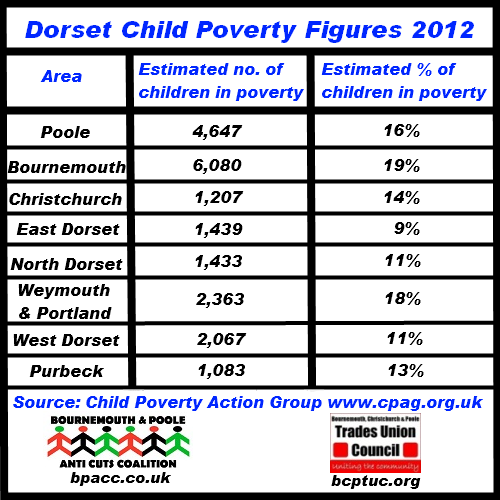 In Bournemouth, 33% of children within Kinson South are living in poverty whilst in Littledown and Iford the figure is 8%. In the Poole Town ward, within Alderney it is 30% whilst in Broadstone it is below 5%. Click here for the full percentage breakdown for all wards within Bournemouth, Poole and Christchurch. Excel spreadsheets detailing percentage figures for all South West local authorities can be viewed and downloaded by clicking here. Providing support with the cost of essential items such as replacing cookers or fridges for families on a low income, as the Social Fund is replaced by schemes run by local authorities. Deciding who receives help with paying Council Tax, as Council Tax Benefit is replaced with local assistance schemes. The Resolution Foundation has found that low income families will see their council tax rise by up to £600 a year as a result of this change. Deciding who should receive support with housing costs. 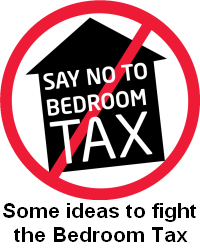 April 2013 will see the introduction of the £500 a week benefit cap and the bedroom tax for families who live in social housing if the government believes they have a spare bedroom. Local Authorities have been allocated control over Discretionary Housing Payments, which they can use to help make up rent shortfalls for a small proportion of families affected by these changes. End Child Poverty believes that Local Authorities should take a strategic decision to protect the poorest families with children when allocating these resources. Local Authorities have not imposed these cuts but, with the removal of ringfencing, they will have a significant influence over how they affect local residents. This entry was posted in Campaigns, Cuts, Health / Social Care, Welfare and tagged austerity, bpacc, child poverty, cpag, cuts, education, employment, end child poverty, health, housing, poverty, social care. Bookmark the permalink.